I’m not actually there — I’m at my Web internship at The Dallas Morning News. So, what did I do? I set up this CoverItLive blog to automatically aggregate all the tweets tagged #knc09 #fncm09 #kncmit (translation: Knight News Challenge, Future of News and Civic Media and Knight News Challenge Massachusetts Institute of Technology) so I (and others who can’t follow all the awesomeness minute-by-minute) can read them later. My conference craziness for the semester finally ended on Sunday. This past weekend I attended the Associated Collegiate Press/College Media Advisers conference in Kansas City, Mo. The Miami Hurricane sent six people, four from the newsroom and two from the business office. Other UM student media also sent staffers, including five from the Ibis yearbook and one from Distraction magazine. The respective Hurricane and Ibis advisers also attended. Another UM professor, Rich Beckman, was the conference’s first keynote speaker on Thursday (Mark Glaser of MediaShift was the keynote on Friday). Rich started his talk by discussing how the newspaper industry fell behind with the Web. But, instead of harping on the negative, he mostly offered advice for the hundreds of students and advisers in attendance. Video excerpt of Beckman’s keynote, shot by Anthony Pesce. Understand audience, usability, social networking, etc. Rich also discussed how multimedia design and infographic skills as well as multimedia programming and producing skills will land you the best (and best paid) jobs at top news organizations. Besides the familiar faces, I got to see some new faces and meet some people in person for the first time, including Andrew Dunn, Anthony Pesce (whose video is embedded above) and Miles Skorpen. I’d known each through Twitter and the latter two from CoPress, so it was great to hang with them at the conference. I also had a mini reunion of sorts with David Grant, editor of the Collegiate Times (Virginia Tech) and Kristen Daum, editor-elect of the State News (Michigan State). The three of us were part of the Al Neuharth Free Spirit scholarship class of 2005. The Hurricane didn’t win an online Pacemaker, but we got a pretty plaque for being a finalist. So, we’re looking to next year’s competition, when we’ll be entering the new WordPress site that Brian Schlansky and I created last summer. I’ll be playing producer and leading one of five video teams today for an Election Day 2008 multimedia project, which is being organized by the UM visual journalism program. The group, which also includes seven still photo teams, is being led by vis-j faculty Jim Virga, Kim Grinfeder and Rich Beckman. We’ll be working in the West Grove and later putting together a site with all the stories, expected to launch soon after the election is finished. Note: This is not live coverage, but instead a documentary-style project. I’ll write a recap post with my thoughts and a link after it launches. Until then, follow the project on Twitter. Alex de Carvalho (@alexdc), who is one of the project’s other coaches, and I (@greglinch) will be live tweeting using the hastag #grove. Thursday night I finished a video about the UM student production of Cabaret (see related tweets), which I shot on Monday and Wednesday. This is my first video of the year for The Miami Hurricane, where I advise online and multimedia production, and I plan to shoot more throughout the school year. What’s noteworthy about this piece is that it’s the first time I’ve used Soundtrack Pro to fix the audio after editing the footage in Final Cut Pro. I’d previously only used Soundtrack for audio projects. The video is online with a story by Nick Maslow and is on my Vimeo page. It also appears in a nifty widget on the sidebar of my site. For more information about the musical, visit the Ring Theatre‘s site. Enjoy! Beginning at around 8 a.m. Friday morning, I will use the The Miami Hurricane‘s almighty Twitter account to liveblog a Barack Obama rally at the University of Miami. The event, “Women’s Rally for the Change We Need” rally, will take place on the main campus in Coral Gables. To easily find the related tweets, search miamihurricane + obama. Read The Hurricane story, Obama to campaign on UM campus Friday; will focus on womenâ€™s issues. Watch the UMTV livefeed online. Doors open at 9:30 a.m. and Obama is scheduled to speak at 11:45 p.m.
Tickets, which were available online, sold out in less than two days of the university announcement on Tuesday, according to a university e-mail newsletter. Because more tickets were allotted than the BankUnited Center (our basketball arena) can hold, there is likely going to be quite the crowd early Friday morning. I’ll be there to provide updates and photos using TwitPic. This will be the third large-scale event I’ve used Twitter to liveblog for The Hurricane, the first two being a baseball game last spring and the first home football game this fall when we played Charleston Southern University at Dolphin Stadium. For the football game tweets, you can search for miamihurricane + football on Twitter. Also, I liveblogged the bus ride to the stadium (search for miamihurricane + bus). Check out some random photos I’ve snapped using my photo and uploaded to TwitPic. This post also appears on the Innovation in College Media blog. 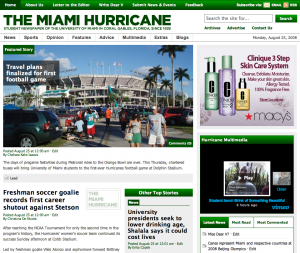 The question we’ve heard most often since launching the new TheMiamiHurricane.com is, “How did you do it?” Below, Webmaster Brian Schlansky offers a comprehensive explanation of the process, from setting up our own Web server to installing WordPress to importing our College Publisher archives. To contact me, visit www.greglinch.com or e-mail greglinch[at]gmail.com.